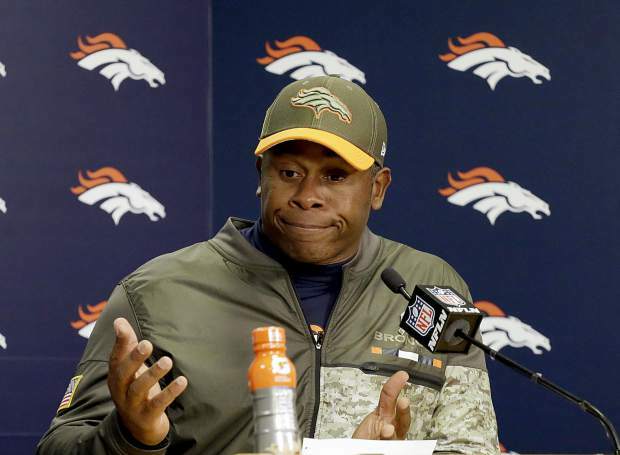 Denver Broncos head coach Vance Joseph looks like he's out of answers when it comes to his team and so are we. The good news is that the Cincinnati Bengals come to town next. 1. Patriots (7-2) … Five in a row after 2-2 start. 2. Eagles (8-1) … Their D hits Big D.
3. Steelers (7-2) … Five home games left. 4. Rams (7-2) … Big test at Minnesota. 5. Saints (7-2) … How is this happening? 1. Giants (1-8) … Losing to the Niners makes you No. 1. 2. Browns (0-9) … In the driver’s set for top pick. 3. Niners (1-9) … Sweet, merciful bye week. 4. Bears (3-6) … Big games with Browns, Niners ahead. 5. Dolphins (4-6) … I still hate Jay Cutler. In Week 10 NFL highlights, the San Francisco 49ers actually scored more points than another team to record an actual win. Seriously, the New York Giants might want to give up football after losing to the Niners. San Francisco also might have blown its chance for the coveted No. 1 draft pick with the win. This is a nice way of saying that the Patriots destroyed the Broncos, 41-16, last week, and it wasn’t even that close. The Giants’ only win of the year, yes, came at the expense of the Broncos. Anyone else wonder how Ben McAdoo still has a job? Since Denver’s lost five straight, we’re going to talk about other things NFL. • Did anyone think the Jaguars (6-3) would have a better record than the Cowboys (5-4) halfway through the season? Jacksonville’s defense is great and usually so is running-back Leonard Fournette. Really, all the Jaguars need to do is not have Blake Bortles vomit on the field, which he pretty much did against the Chargers last weekend by throwing two fourth-quarter interceptions. Jacksonville is 6-3 tied with the Tennessee Titans and has an easier schedule down the stretch than does Tennessee. Meanwhile, the Cowboys were up and down before Ezekiel Elliott got suspended — we think … maybe; no, at last check, yes — and it isn’t going to get much better for Dallas. Look for Washington to surge by the Cowboys into possible wild-card contention in the NFC. • The Saints have won seven straight? New Orleans leads the NFC South by a half-game over Carolina. We’re going to find out if the Saints are for real in the next four weeks with the Redskins in the Big Easy, at the Rams, home for the Panthers and at the Falcons. Speaking of the Dirty Birds, they’re 6-4, despite their struggles. Some combination of the Cowboys/Redskins, Saints/Panthers/Falcons and Rams/Seahawks will not make the playoffs. • The Minnesota Vikings are 7-2 and in total control of the NFC Central. The bigger issue is that Teddy Bridgewater is back, but Case Keenum has been playing great. What do they do? They take Keenum out. Yes, he’s done a great job, but he’s a backup. Bridgewater can win you playoff games. Keenum cannot. • Hey, we have a decent “Thursday Night Football” game — Titans at Steelers. Novel concept. • All eyes should be on Redskins at Saints in the Sunday, Nov. 19, morning slot. If you have “Sunday Ticket,” then flip between this and Rams at Vikings. • We’re thinking that CBS was hoping for more from Patriots-Raiders in Mexico City in the afternoon window. By the way, the Broncos are hosting the Bengals in this slot and Denver’s losing streak should go by the wayside. • “Sunday Night Football” is Eagles at Cowboys. This should be Philly’s game to win, but the Eagles are a marked team for the rest of the season, particularly within the NFC East. • Falcons at Seahawks is “Monday Night Football,” which should be fun. Are the Falcons turning the corner? The answer would be yes, if they can win in Seattle.